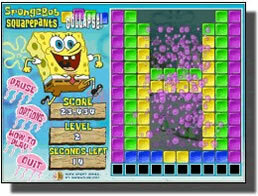 Sponge Bob Collapse Game - Download and Play Free Version! 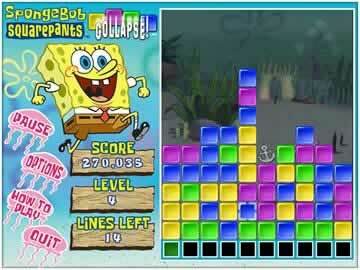 All the fun of the original Collapse game - now with Sponge Bob! The award winning Super Collapse now features the crazy antics of Nickelodeon's Sponge Bob! Click on groups of like colored blocks to remove them from the game board. In this version of Collapse, special item blocks like jellyfish and bubbles will appear to help you clear lines quicker. Clear enough lines and you will advance to the next stage. 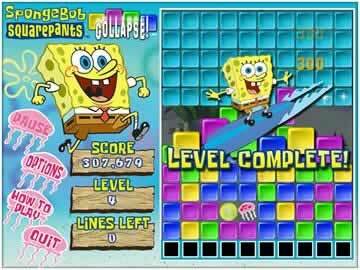 This highly addictive and fun game also features bonus levels where you try to clear the screen of all the blocks before time runs out. If you can accomplish this feat, you will be rewarded with huge point bonuses. Sponge Bob Collapse is way too much fun! Player created video showing you what you will experience playing. Haven't played a Collapse game yet? This is a great one to try. Many non-gamers pick up Collapse games and absolutely love them for their simple game play and relaxing quality. A nice stress reliever after a hard day of work or school.